Economical Post Column Derivatization Kit (EPOCOD) is an economical and compact unit placed between the HPLC column and the detector designed to facilitate the convenient mixing of the analyte containing eluent from the HPLC column with chemical derivatization agents. 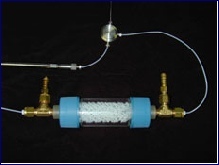 The kit includes a PTFE knitted reactor coil, a column jacket for temperature control and a “T” connector for convenient mixing of the analyte with post column chemical derivatization agents. A standard EPOCOD comes with a knitted reactor coil 5 meters long x 0.5 mm ID in a 4” long column jacket (EP B-4-5-50). Other combinations of knitted reactor coils and column jackets can be provided based on your specific analytical needs. A water circulator is used in conjunction with the column jacket to control the temperature of the post column chemical derivatization reaction.